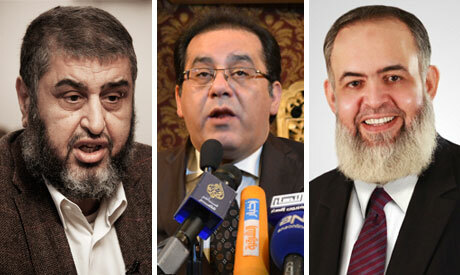 Salafist preacher Hazem Salah Abu-Ismail, ex-intelligence chief Omar Suleiman and Muslim Brotherhood leading figure Khairat El-Shater will each appeal the decision of the Supreme Presidential Electoral Commission (SPEC) to eliminate them from Egypt's presidential race. The three were officially disqualified as presidential candidates Saturday, along with seven others. Immediately after the announcement of the decision, Abu-Ismail lashed out at SPEC while speaking to Salafist channel El-Hekma TV. He stressed that he had not been officially informed of the decision until 10pm Cairo time Saturday, hearing of his elimination through the media, which – from his perspective – reflects the illegality of the decision. Abu-Ismail also alleged that the SPEC had arbitrarily dismissed a State Court verdict, which was issued on Wednesday, mandating that the interior ministry provide him with an official document stipulating that the ministry could not conclusively prove that his mother held a foreign nationality – a staus that would automatically disqualify him as a candidate for president. Sources in SPEC, which, pursuant to Article 28 of the March constitutional declaration, is not subject to judicial authority, told Ahram Online that Abu-Ismail was eliminated because evidence had emerged that his mother actually held US citizenship. “I know he [Anan] planned for certain things; I know witnesses who can collaborate my claims,” the Salafist cleric stated without elaboration. Ikhwan Online also reported that Mukhtar Ashri, chairman of the legal committee of the Brotherhood’s Freedom and Justice Party (FJP), had announced plans to submit a formal grievance against the SPEC for its decision. SPEC sources say El-Shater was declared ineligible to run for president because of a previous criminal conviction, noting that the pardon he received earlier from the SCAF had not been acknowledged by the SPEC. El-Shater’s questionable legal status was cited as a reason why the Brotherhood had opted to field a second, alternate presidential candidate, FJP head Mohamed Morsi. In 2006, El-Shater was accused of money laundering and of funding the then-banned Brotherhood group. The case was referred to the military prosecution, which sentenced him in 2008 to seven years in prison. He was only released four years later, after the ouster of longstanding president Hosni Mubarak in February 2011, for health reasons. Suleiman, who also briefly served as vice-president during last year's 18-day uprising, has yet to comment on his elimination from the race, although Ahram Online has verified his intention to appeal the SPEC decision. Sources from the SPEC told Ahram Online that Suleiman’s campaign did not fulfil all requirements for candidature, saying his endorsement forms had not been properly gathered from citizens across 15 Egyptian governorates. Additionally, Suleiman, along with Mubarak’s last prime minister Ahmed Shafiq, could both be eliminated, in any case, should a Disenfranchisement Law passed recently by parliament be signed into law by the SCAF. The law bars anyone associated with the former regime over the past ten years from contesting the presidency. SPEC head Farouk Sultan has said that disqualified candidates could appeal against the decision up until Monday. Other presidential hopefuls to have been ruled out of the race are acid-tongued lawyer Mortada Mansour; liberal Ghad Al-Thawra Party founder Ayman Nour; English teacher Ibrahim El-Gharib; former state director of antiquities in central Upper Egypt Ahmed Awad; ex-general intelligence officer Mamdouh Qutb; Egypt Arab Socialist Party candidate Hossam Khairat; and Ashraf Barouma of the Egypt Kanana Party. At a press conference held at his residence in Alexandria late Saturday, Nour, too, said that he would appeal his elimination. The veteran opposition figure was ruled ineligible having been convicted previously on criminal charges. As in El-Shater's case, the pardon Nour earlier received from SCAF was not acknowledged by the SPEC. Nour says he plans to ask Field Marshal Mohamed Hussein Tantawi to alter Article 60 of the constitutional declaration, which concerns the SPEC, along with Article 28. Media reports also confirmed that Qutb would appeal against his disqualification. Qutb’s elimination came as a result of the resignation of his El-Hadara Party's parliamentary bloc. Egypt's first post-Mubarak presidential elections will take place on 23 and 24 May, with a runoff round – if necessary – slated for 16 and 17 June. The new president will be officially named on 21 June.